Help out, learn something new, and have a great time! 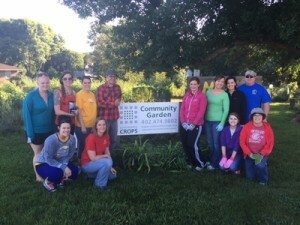 By volunteering with Community Crops, you’ll have fun while making a direct impact through Community Gardens, Youth Education, Prairie Pines Incubator Farm, classes and more! Volunteers in this area help us shape each community garden into a unique community, whether you help with gardening, artwork, or education. We’re a nonprofit, so assistance with day-to-day tasks is essential. This includes greeting guests, directing questions, taking messages, entering data, mailing letters, helping with special events, etc. Like working with young people? We are looking for folks to lead weekly garden themed clubs on a quarterly basis with our elementary and middle school gardening programs. If you have a specific skill or interest to share, we are always looking for speakers for one-time visits, or lend a hand doing regular maintenance throughout the summer. We need your help to promote and support our events including Earth Day in April, Plant Sale in May, Garden Gala in June and Feast on the Farm in August. Or, share the yearly work of tabling at community and neighborhood events. Volunteers are needed throughout the year to help with various jobs such as preparing beds, planting, working on equipment, weeding and harvesting at the Prairie Pines Incubator Farm. Or, join us at the greenhouse for soil blocking, seed germination and caring for seedlings! Have a specific skill or interest that you’d like to share with Community Crops? Let us know! Sign up as a Crops Volunteer and give us more information on your interests.